Minute-to-minute news updates, live tweeting, expanding Wi-Fi coverage, Periscope feeds, push notifications—it’s no wonder that “real time” has become the norm for how we operate in the world. And the consumer, a major player in fueling this cultural phenomenon forward, has come to expect nothing less from the brands and technologies that make “real time” a reality. So what about for those of us in the AV rental, conference, and staging markets? We are no exception to the rule. In the case of identification technology, one product—the E Ink Electronic Nameplate, a digital electronic nameplate using TAIDEN breakthrough technology—has found its stride in a real-time world. The E Ink Nameplate by Conference Rental exists to identify attendees, nations, or other key signage elements such as company logos at a conference or meeting, large or small. Its standout feature lies in the product name—it’s electronic. A digital nameplate seems simple (practically everything is digital these days, right? ), but in fact, the E Ink Nameplate is the first of its kind. Its value in the AV market is clear: The technology of the electronic nameplates allow for on-the-fly changes, as needed. This benefit is invaluable. A digital identification solution means that media planners and conference organizers can avoid some of the standard pitfalls and headaches associated with identification at events: misspellings, last-minute name changes, size and font issues, finding a source that can handle the full workload of the job by your deadline. In comparison to traditional tent cards—printed or engraved solutions that, surprisingly, are not a thing of the past—this product uses digital technology that facilitates easy setup and breakdown. The E Ink Nameplate is a cost-effective solution that, at the end of the day, saves time and energy. And the value of saving time and energy in the event planning world should never go unstated. So how does E Ink work exactly? While we won’t get too technical on you (; you can learn more of the science behind E Ink here), it’s worth calling out the solution’s acclaimed, low-consumption, non-glaring technology. The product’s two-pigment ink system displays content through millions of tiny microcapsules containing positively charged white particles and negatively charged black particles, all suspended in clear fluid. Particles move to the top of the microcapsule and become visible on the nameplate when a positive or negative electric field is applied. The surface appears either white or black at the spot in which the particle lands, so what we see, as the viewer, is the work of electronic ink. 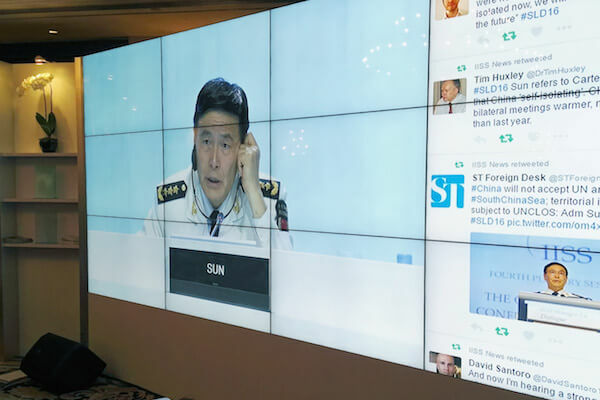 In a recent case study, Conference Rental discussed the seamless identification process provided at the 14th Asia Security Summit, a high-profile event for national security advisors and defense ministers of the International Institute for Strategic Study (IISS), in May 2015. So what did it take to make the IISS experience, well, the experience? It’s simpler than you think. In short, it was clear that Conference Rental’s product offered a cost-effective, eco-friendly solution for the conference organizers, product managers, AV integrators, and meeting planners at IISS. When you are introduced, what’s the first thing you share? Your name. Who you represent. Where you come from. These identifiers are the core of our essence, what we stand for, where we’re from. Proper identification is crucial, no matter the stature of an event (from moderately sized corporate meetings to large, high-profile conferences at international congress centers, or even small executive meetings held among just a handful of people). AV integrators and designers must remain up-to-date on the most efficient, seamless, even elegant ways in which they can design for conferences. The nameplate, with compact dimensions 310mm x 60mm, is a standalone wireless tabletop solution. The information displayed can be controlled locally via USB or wirelessly using Wi-Fi. This means that organizers can, using the E Ink Nameplate, quickly and easily switch names or IDs between different event programs or sessions. The beauty in this is that rental companies, many of which don’t know that this technology exists for nameplate signage, can handle minute-to-minute changes leading up to the main event. This is a battle that the AV world knows well. “From an operator’s perspective, this particular feature has been very helpful to us in terms of real-time updates to the nameplates. Not having to reprint individual nameplates has saved us considerable time, effort, and money. Instead, we can now make changes remotely, which has been excellent,” stated Saunders. This flexibility in last-minute changes is a solution that the conference rental market needed. The value added is clear: Companies can now better solve for the unique needs of many clients, in many scenarios. What does it mean for an AV solution to be truly “breakthrough?” In its truest definition, breakthrough implies “new.” So it means that a product, said quite frankly, has never been done before. The product breaks through an obstacle or challenge, claiming a positive impact how we interact with the world—and with each other. Every day, AV companies compete to create solutions that they believe to be breakthrough. But it’s not that simple. The innovations and solutions that actually hold true to their claims are the ones that stay afloat. When asking ourselves if the new Conference Rental E Ink Nameplate is truly breakthrough, we can say with a confident yes that it is. It is new, it is innovative, and it changes the game for nameplate signage in the conferencing world.